Stop By an Open House 15 & 16 Dec! 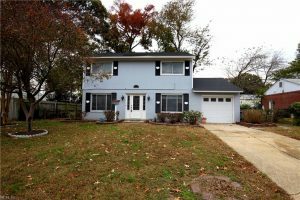 | Hampton Roads Real Estate :: Abbitt Realty Co.
Stop By an Open House 15 & 16 Dec! Stop by an Abbitt Open House this weekend! Great two story home in Foxbridge area. Architectural shingles are supported by 3/4in OSB over the entire roof. Large storage shed with composite siding. 16′ pavers provide a beautiful patio area for entertaining. 4 bed rooms 1 and 1/2 bath, formal dining and living rooms. Family room has new wood flooring with sliding glass door to fenced backyard. Parquet wood flooring in living and dining rooms. All bedrooms have wood flooring and ceiling fans with lights. The kitchen has lovely granite counter tops, oak cabinets, stainless steel appliances, a double door refrigerator and new stove: All designed for maximized efficiency. One car garage. Entire home interior has been freshly painted (November 2018) Warm gas furnace, water heater and replacement windows. This beautiful 4 bedroom 3 bath home is located in the desirable Patriots Walk Community. These homeowners did not hold back from adding their own charm! With an upgraded 4 zone irrigation system it is sure to keep the yard looking phenomenal. You can park your car in the 2 car garage or on the oversized aggregate driveway. Having a fully fenced in backyard you can enjoy your covered back deck with privacy. Upon entry you will find an upgraded formal dining room with hardwood flooring throughout. With the kitchen having new backsplash it really adds a lot of character! There is a very lrg LR with a breakfast nook around corner. The massive 1st floor master features TWO large walk in closets, beautiful garden tub and a walk in shower. This home has a completely finished bonus room above the garage with additional attic storage on each side. Upgraded security system has been installed along with a whole house water filtration system. This home has so many extras. Come see for yourself! !